Nature Photography. One has to travel to Stony Hill or the The gap to get the beautiful nature photography of Southern Lights. Many photographers take only pictures of the sky to capture the beautiful southern lights, but Douglas Topping went further and added some more elements in the focus of the photo resulting in some of the most beautiful southern lights picture ever taken. 'The Gap' is a famous natural formation in the Torndirrup National park outside Albany where a slice in the granite coastline forms a sheer drop of almost twenty five metres. It is a rare sight to see southern lights in WA and the best place to catch them is in Tasmania during September. 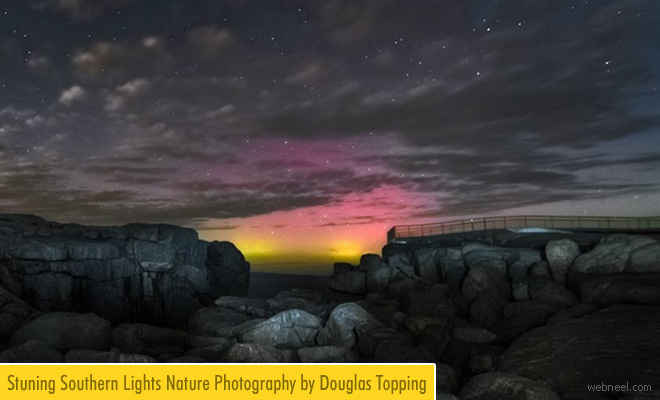 Douglas Topping was a finalist in the 2015 Nature at Night and he is working hard to win few titles this year. So lets applaud his work.